If you’re in the market for the best 1-4x scope, you’ll need to cut through the junk that is currently flooding the market. That’s because there are a ton of low quality scopes that won’t work just as effective as one with good quality. You want something that’s tough. You want something that can still hold zero after so many shots. You want something that won’t be a pain to install. Each buyer has their very own personal wishlist. The question is: what preferences and needs are on your list? And which scope will satisfy them? Thankfully, we’ve done our job and hand-picked twelve of the best 1-4x scopes that are currently on the market. You’ll need a great scope for your gun in order for it to achieve its potential in terms of accuracy. Not only that, you want something that has a good level of magnification so your accurate shots can be even more precise. Obviously, since we’re dealing with 1-4x scopes, this is at the top of the list. The 1-4x is the magnification that you’ll be looking for. But what is the reason behind the magnification feature of a scope? You want a scope that gives you full control over the distance you want to shoot at. So, you want a scope that will allow you to hit a target at ranges out to 100 yards, 200 yards, or wherever you want to hit your target. With that in mind, the ability to magnify up to 4 times is essential when finding a scope like this. Parallax is an issue that plagues gun owners who rely on scopes all the time. This is especially frustrating when they’re trying to make a target that is sitting or slowly moving at a distance. This issue occurs when the reticle and target are not aligned on the same plane. To ensure a clear shot every time, it is important to find a scope that has parallax adjustment. Keep in mind that each scope has their own preset for parallax. So, it won’t be the adjustment you have to use. Adjust it to your advantage so you get a good clear shot every time you use your gun. Since we’re on the subject on magnification, the other thing we need to look at is the objective. The objective is the diameter of the outside lens or where you look into the scope. If you have a scope that has a larger objective, this means you’ll have a wider field of view. This is a much needed factor if you intend to utilize your scope for long-range shooting. Likewise, if shooting at long range is not your style, a smaller objective would be ideal. First on the list, we have the Nikon P-Tactical. Nikon is best known for selling high quality cameras. However, they didn’t stop there in providing some of the best optics in gun scopes. And that’s exactly what you’ll get with the P-Tactical scope. This comes with the patented BDC reticle with points and hash marks that measure from 100 to 600 yards out. The body is a one-inch tube crafted from high quality materials that will ensure that your scope is tough enough to handle the recoil and help it hold zero after repeated amounts of impact. This comes with sets of turrets. Each of them are used for windage and elevation adjustments. These turrets are spring loaded so you can instantly get a zero reset. If you want excellent eye relief, you got it with the P-Tactical. If you want the best in clear optics, you’ll get it no matter what the light conditions are. That’s because the P-Tactical has a bright, fully multi coated optics that will give you a clear view of your target and will illuminate it, even if you’re in a low-light condition. Whether it’s sunrise or sunset, you’ll still be able to see a great deal. Best of all, the P-Tactical has a zoom range of up to 3x. Which means you’ll be able to get a good look at your target and get an accurate, but precise shot every time. This is a shockproof, waterproof, and fogproof scope. Strong, durable, clear optics...what more can you get out of a scope like this. On paper, this appears to be one of the best of the best. So, if you’re looking for a top quality scope that will last you a good while and still be able to if you a clear shot, the P-Tactical can be your best friend either out in the field or on the range. Next on the docket, we have the Monstrum Tactical G2 1-4x24 FFP Rifle Scope. This is the best scope for those who need to use one for tactical situations. If you want a high powered tactical scope with generous eye relief and magnification levels ranging from 1x to 4x, you’re going to love this thing. This has an innovative first focal plane (FFP) rangefinder reticle. The reticle has an easy-to-read ranging information that will remain constant regardless of what magnification setting you have it at. This is perfect for holdover correction and faster range estimation. The dial controlled reticle illumination features a green or red light. This is equipped with multiple brightness intensities to ensure better visibility of the reticle at night or in low light conditions. This scope is constructed with aircraft-grade aluminum with a sealed 30mm sealed, nitrogen tube for resistance to water and fog. This is an excellent scope if you want a good accurate shot that can reach up to 400 yards. Even better, you have a magnification level of up to 4x. With the ability to hit from such a range accurately and with more precision, this tactical scope might be your best choice if you’re looking for a scope that goes well with your gun of choice. The Monstrum Tactical might be a bit on the pricey side for those on a budget. But the way it performs is worth every single penny. If you have a budget that allows you some breathing room, you should consider this scope in particular as a possible choice. Up next, we have the Athlon Optics Talo BTR Riflescope. This has a 0.2 MIL, 40 MIL Total Adjustment fixed parallax. This will help you easily adjust your scope when parallax becomes an issue. The fully coated multi-coated optics are designed to reduce light that’s reflected and to give you a brighter image by increasing the transmission of light, which is better compared to normal single coated lenses. The Athlon is waterproof, so it will protect your scope in either the harshest of weather conditions or if it ends up submerged in water. Either way, this is a scope that can handle nature’s elements. The one piece tube is heat treated and provides unrivaled strength compared to other scopes currently on the market. The one piece tube is actually better as it is designed to keep moisture out and at the same time, keeps the scope fog proof so you always get a clear shot no matter what. The reticle is glass etched and provides tremendous backing support for a complex design of the reticle. It also offers resistance to shock from recoil and great durability. For all that from a one piece scope, that isn’t a bad thing to have. If you’re looking for an excellent scope that appears to be the strongest on paper and will hold zero after sustaining a lot of impact from recoil, you’d be hard pressed to find anything other than the Athlon Optics Talos. Bushnell has often been one of the brands that longtime gun owners and enthusiasts have trusted for the longest time. And they do this for a good reason. Bushnell is one of the best when it comes to manufacturing high quality gun parts. With a scope like the AR Optics, they continue to prove themselves that they are worthy of such a title. This features fully multi-coated optics with magnification ranges from 1-4x. This has an illuminated FFP bar reticle with 11 different illumination settings. This has an exclusive throw down PCL level in case you need a quick power change. This has click adjustments that measure in 0.1 mil increments. At length, the Bushnell measures at approximately 9 inches. If you’re looking for a scope that can perform in low light conditions and hit your targets accurately at up to 500 yards out, the Bushnell is exactly that. Even in low light conditions, if you can clearly see the target that far away, there is no way your shot can miss. The body is made from high-durability aluminium alloy that has an anodized finish to protect the scope from the inside and out from nature’s elements. For the best in brightness and toughness, the Bushnell AR Optics is the scope that will stand the test of time and usage. Don’t be surprised if this is a scope that sticks with you after a few years of dedicated use. The TacFire is yet one of a handful of tactical scopes that will give the others a run for their money. The housing and the mount are both crafted from aircraft-grade aluminum. That’s the kind of material that is a popular choice among gun buyers. The reason is because it is considered the best in terms of durability. In fact, it’s pretty much indestructible. No matter how many rounds you fire off, the TacFire will stick with you for a long time if you take good care of it. If you don’t want to wait until the weather holds off, this scope can withstand the elements. Rain or shine, you’re still going to get quite the clear view. Your magnification levels will obviously range from 1x to 4x. Lastly, the TacFire will help you see your target much better in low light settings. If you want all round toughness and a pretty awesome field of view to go with it, the TacFire will look good on your rifle. The Burris MTAC 1-4x 24 Illuminated scope is next on our list. This is a scope that is backed by a lifetime warranty. It’s good to have a scope that will last you a lifetime. And if anything happens, Burris will come good for it. So, what makes it one of the best on the market? This is crafted from the highest quality materials. Of course, this equals to superior durability. To make sure that is does its job in being durable, Burris tests each one of their scopes. Complete quality and reliability is what their aiming for in their products. The main tube diameter measures out at about 30mm. The field of view is measured from 100 feet at 100 yards to 32 feet at 100 yards. The exit pupil measurements can range to about 24 millimeters on the low end to 6 millimeters on the high end. The scope itself measures at 11.3 inches long and is lightweight at just about 17 ounces. Also included in this scope is one lithium ion battery. This is used to power the scope and allow you to see your targets in low light conditions. No matter what illumination setting fits you best, you’re still going to get a clear shot regardless if it’s dawn or dusk. While the price tag may be a bit hefty for some, the Burris’ performance is worth every penny. If you’re looking for an excellent illuminated scope that is lightweight, but still can take a beating, you’ll probably want the Burris MTAC scope for your gun. The Valken not only has the ability to magnify from 1 to 4x, it also has finger adjustable elevation and windage screws. If you want extra long eye relief, this will allow you a generous amount. It is measured at 4.5 to 5 inches. You can be able to get a clear field of view even if you’re using both eyes. The reticle is etched in glass and has a 20 MOA circle with a 3 MOA dot. The illumination comes in two colors: red and green. Either way, you’ll get a good clear view through your scope, especially in low light conditions. Choose the color that is best comfortable for you and go about using it as intended. This is a good scope to have if you’re on a budget. Not to mention, Valken is a brand that has been familiar with those who use paintball guns for competitions. Now, they’ve branched out in manufacturing parts for those who want to get the most out of their guns on the range and out in the field. This is a brand that gun owners and enthusiasts alike should keep an eye on. With that in mind, the Valken is a decent scope that will give you a clear view and precise accuracy with every shot you take. It’s even better if you have a scope that will give you powerful illumination, no matter what the lighting conditions. Once again, we’ll be reviewing a Burris scope. This time, we’ll be looking at the Fullfield TAC30. And it’s probably one of their best scopes made by them. It’s designed for law enforcement and military personnel, but they were kind enough to give their customers a civilian edition. For the reticle, it’s bright enough for you to see in low light conditions. The magnification levels are 1x to 4x. Since you’ll be able to see your target with both eyes at 1x, you can bet that the eye relief with this scope is pretty good. A scope with enough eye relief to allow you to see the field of view with both eyes is good in our book. If you want a scope that is designed for tactical purposes or for target shooting, the FullField will give your rifle that intimidating, military-style look. If you’re looking for a high quality scope that will withstand all kinds of weather and recoil, then look no further than the UTG. One of the best features that stands out is the two types of illumination you get. One illumination type includes a red and green dual color illumination. The other consists of 36 different colors. This illumination mode is the best when you’re out in the field and nature decides not to cooperate. Rain or shine, you have a good friend out in the field that won’t let you down. Plus, you can still get a good view even when the precipitation won’t quit. The next scope up for review is the Steiner Model P4Xi. This has low profile turrets and illumination controls. The reticle is an illuminated P3TR reticle that is equipped with 5 day, 4 night, and 2 LV illumination levels. There is an “off” switch for each of the 11 illumination settings. This ensures that it is disconnected from the battery and will preserve the battery life. This is a scope that is designed for patrol rifles. If you’re in law enforcement, the military, or use your gun in tactical situations, this is the ideal scope for you. The Steiner is an award-winning scope, racking up accolades that include the 2018 NRA’s Shooting Illustrated Optic of the Year. Most importantly, the Steiner comes with a lifetime warranty. If something happens, you can be able to get it repaired or replaced at no cost to you. The Steiner has a windage and elevation click value of 0.5 MOA. With a magnification of 1x to 4x and decent eye relief, this scope is great for target practicing, competitive shooting, or tactical operations. The Steiner is available in two models: Law Enforcement and Civilian. The TRUGLO Tru-Brite scope is crafted from a one piece aircraft-grade aluminum tube. On top of that, this is a shockproof, waterproof, and fogproof scope. At this point, you know exactly what you’re going to get with this feature in particular. The 1x magnification is designed for extremely fast sight picture. This also as an eye relief measurement of 3.5 inches. So you can still be able to get a good view, even if you’re using both of your eyes. Included with the TRUGLO is a reversible, offset monolithic 30mm scope mount that is made from CNC-machined aircraft-grade aluminum. This also has turrets in both the .223 and .308 that can engage targets at long range. The MIL-DOT reticle enables users to determine the distance between targets of a known size and provides quick trajectory and wind drift reference. Our final scope for review is the Trijicon RS24 AccuPower Riflescope. This has superior quality lenses that are multi-coated to provide superior clarity and light gathering capabilities with no distortion to speak of. The illuminated reticle is powered by a CR2032 battery. This comes with eleven adjustable illumination settings. Each of these have an “off” setting to ensure that it won’t drain down your battery. The housing is crafted from aircraft-grade aluminum and is constructed to take on every single element nature can throw at it. Knowing that you have a scope like this out in the field during bad weather will make you breathe a sigh of relief. That is...if you equip it to your gun. This also has a second focal plane reticle. This will remain constant as you increase the magnification levels. This will provide you with a more exact aiming point. The Trijicon is one of the best brands on the market when it comes to gun parts. In fact, it is the most preferred brand among the circles of law enforcement and the military. No matter what your intent or purpose is, you can get a tough scope that will give you an excellent field of view every time you use it. Are you a hunter? Are you a competitive shooter? No matter what you’re using your gun for, finding a great scope for the purpose of enhancing its overall performance is key. 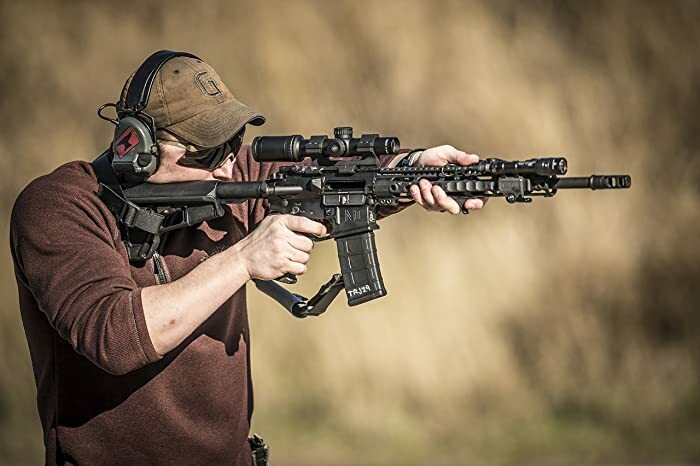 If you intend on using your gun to hit long range targets, then you obviously want something that will be able to give you a clear shot and a precise aim for targets that stand out at ranges from 200 to 300 plus yards. Quality should be held in the highest regard. Most guns have an amount of recoil so strong that it can throw off the zero of cheap, low quality scopes. You want a scope that can absorb a great deal of shock repeatedly. As an added bonus, you should have a scope that will continue to hold zero after absorbing so much shock. Furthermore, a good quality scope will also have the ability to withstand adverse weather conditions like rain and snow. Lastly, price might be a factor in your decision. If you’re on a budget, the important thing to do is look for a scope that is still solid in quality. Just because you’re on a budget, doesn’t mean you have to settle for a cheap model. Find the best quality scope available within your budget. Because a good quality scope, even at an affordable price can perform just as good as their high-priced counterparts. Finding the best 1-4x scope doesn’t have to be a challenge. But knowing what’s on your wishlist for an idea scope will make your search a lot more easier. If you see a scope that sticks out as one of your favorites, do not hesitate to research it even further. It’s important to know what people are saying about the scope and how well it has performed for them. Sometimes, people may not have some not so good things to say. Either way, take each review with a grain of salt.